After losing to Macomb Community College on Oct. 18, the Hawks thought their season was over. In the Michigan Community College Athletic Association (MCCAA), the top four teams head to playoffs; Henry Ford’s loss to Macomb put them in the fifth place spot. Following this game, it was discovered that Macomb unknowingly had an ineligible player. Therefore, according to the rules, every game she played in was considered a loss. This changed their record to 5-31, putting HFC fourth in the league, sending them to playoffs. The sophomores, who thought their careers were over, were thrilled about the news. “I was shocked, but excited that we could continue on. I could get another chance to prove to myself that I’m the player I’ve always wanted to be,” said sophomore Hannah Sullivan. HFC volleyball coach, Rosemary Motemedi, stated, “I am thrilled that we are going to playoffs, the girls have accomplished so much this year and aren’t done yet.” The Lady Hawks ended with a record .500 season and made it to playoffs, something they haven’t accomplished since they restarted the program. 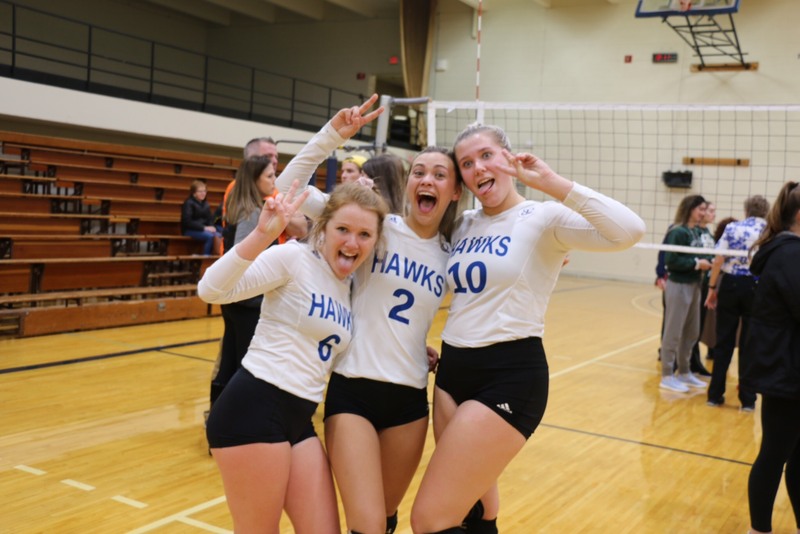 The Hawks traveled to Port Huron to play Cuyahoga Community College on Oct. 31 in the first round of the playoffs. They lost in three sets by a total of 12 points. The ladies put up a tough fight, losing 20-25, 22-25, and 21-25. Sophomore Katelyn Pinkowski led the team with 11 kills and four assist blocks. Freshman Lexie Wamund had five kills and a solo block. Freshman Paige Brothers had nine kills and passed 13 balls without getting aced. Sophomore captain Katelyn Pinkowski and freshman Paige Brothers both led the team in kills this season, earning several awards. Pinkowski was MCCAA All-Eastern Conference 1st team and NJCAA Region XII DII All-Region team; Brothers earned MCCAA All-Eastern Conference 2nd team and MCCAA Eastern Conference All Freshman team. Sophomore defensive specialist Hannah Sullivan received second team MCCAA All-Eastern Conference. Freshman Halee Dorn, the libero, received MCCAA All-Eastern Conference 1st team, All MCCAA team, NJCAA Region XII DII All-Region team, MCCAA Eastern Conference All Freshman team and MCCAA Eastern Conference Freshman of the year. Dorn swept the conference in awards. “It wasn’t expected, but I played every game for the team and I think that’s what helped me in my success,” said Dorn. Coach Rosemary Motamedi earned Coach of the Year for the MCCAA Eastern Conference for noticeable improvement from last season to this season. Next year, the team plans on using these accolades as motivation to work even harder next season. Out of the 12 current players, only three are sophomores. “I want to get the team working earlier this year; we plan to start lifting and working out in the beginning of January,” says Coach Mo. The team did well but are ready to go even further next year.